We'd like to introduce you to our family. 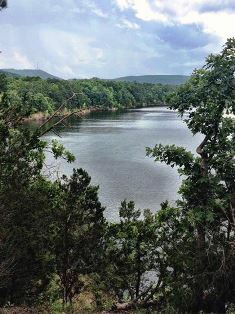 "It was over 60 years ago when my father, Hal Barnes, on an Arkansas vacation, discovered a beautiful Arkansas lake in the heart of the Ouachita National Forest. Before returning home with us, Dad presented a bid to the U.S. Army Corps of Engineers for a lease on a beautiful harbor, which was to become Mountain Harbor Resort on Lake Ouachita. It was his dream to build on the raw shoreline beneath the rolling slopes of Hickory Nut Mountain. That dream became Mountain Harbor has since grown to encompass three beautiful Arkansas lakes: Lake Ouachita, Lake Greeson and DeGray Lake. Iron Mountain Lodge and Marina on DeGray Lake, Mountain Harbor Resort and Spa on Lake Ouachita, Self Creek Lodge and Marina on Lake Greeson now make up our Tri-Pennant Family of Resorts. These Arkansas resorts are family owned and operated, and we have over five decades of lake resort management experience. Not only do we share the tri-pennant in each of our logos, but we also bring you our heritage of offering the finest in Arkansas resort facilities and personal service. We invite you to visit each of our properties—and let us know what you think!" Located just 25 miles south of Hot Springs and only 5 minutes off I-30 near Arkadelphia on wilderness Degray Lake is Iron Mountain Lodge & Marina. This Arkansas resort features beautifully furnished Arkansas cottages—all with fireplaces and hot tubs, a conference facility, a full service marina with rental boats, water toys, and scuba air. An 18-hole golf course is just 10 minutes away. For more information call David and Vickie, our managing partners for more than 30 years. Nestled on the shoreline of Arkansas' largest wilderness lake, the family owned and operated Mountain Harbor Resort & Spa is Lake Ouachita's premier vacation, meeting and spa resort. Voted Best Resort in Arkansas and recipient of the Trip Advisor Certificate of Excellence, we offer a variety of lodging options including lake view cottages, dining and conference facilities and one of the South's largest full-service and award winning marinas. For over 60 years, we've been the place for fun: boating, fishing, hiking on the EPIC LOVit, horseback riding, scuba diving and our nationally acclaimed full service spa. Mountain Harbor Resort & Spa is managed by the Barnes family and a caring group of managers and employees. And we¹re just a 22 mile scenic drive west of Hot Springs National Park. Self Creek is a nearly sixty year old Arkansas resort on Lake Greeson near Texarkana which was acquired by our family of resorts in mid summer of 2002. It features beautiful new two bedroom- two bath and three bedroom- three bath log sided cottages with fireplaces and hot tubs—all with gorgeous lake views. You'll also find a floating marina and ships store, complete with new docks and a fleet of rental boats, as well as Hawg Wild Water Toys - offering jet skis, canoes, and other water toys for your lake adventures! Contact Jim for all of your Lake Greeson vacation needs.